Who is doing this around Montana?? Here are some of the Montana hygienists stories of what they are doing and how they got started in serving the underserved utilizing their Limited Access Permit (LAP). They would be happy to talk to anyone interested in pursuing their own program. My 44 years in dental hygiene has been very rewarding and has offered me many different opportunities. However, none of my previous adventures has been more exciting than practicing with my Limited Access Permit. I was the first hygienist to become LAP certified—and oh what fun I’ve had! I love being able to offer dental hygiene services to folks who wouldn’t otherwise have it available. Currently, I am set up in two long-term care facilities, one is a stationary clinic, the other mobile. Although the paperwork can be a bit hectic, the residents make it all worthwhile. Each has so many stories to share and (most) are very grateful for the services I provide. They even think I’m young! And one gentleman told me I was pretty, but his wife reminded me he is legally blind. Selecting my own hours, working within my own timeframe, and making professional decisions for the residents are definitely pluses for me. Working with the staff and better understanding their responsibility has been enlightening. In-service training has become a very integral part of making the program a success for the residents. It’s hard to believe that I get reimbursed (Medicaid & private pay) for this much enjoyment! The Limited Access Permit is not for everyone, but I offer any encouragement for hygienists who want to go down this path. My door is open and I always have plenty of advice! If it’s “in your heart”—you’ll love it! Suzie Rogge and Melissa Utley are partnered together to form Dental Hygiene Connections. Both are Limited Access Permit hygienists who provide dental hygiene services for the residents at St. John’s Lutheran Ministries in Billings. They formed together over three years ago and work with mobile equipment. They work with this equipment in a room provided by the facility, as well as, bringing the equipment to the many cottages on the facility’s campus. This way they are able to provide care to those residents without them having to leave their own home. Their work began in the larger “nursing home” building and quickly expanded to the cottages. In time, they plan to continue their growth and provide oral care to those in other facilities in Billings. They have found their work at St. John’s to be rewarding and valued by the residents, their families as well as the staff. 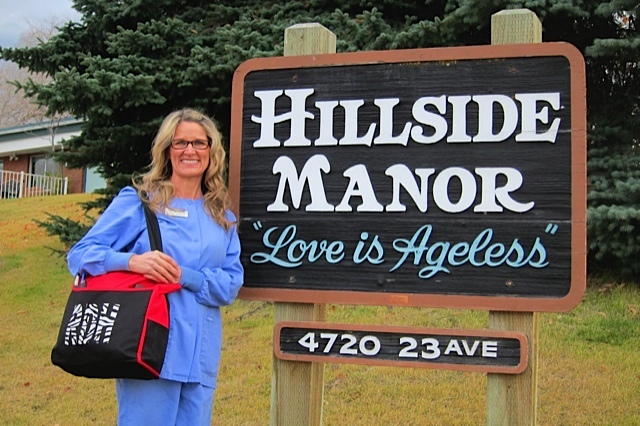 Hi, my name is Pam Yeager, and I have been a dental hygienist for 13 years here in Kalispell. I worked for Dr. Doug Smith for 6 years, and he has a passion for the underserved, such as special needs patients, geriatric patients (living at home and in nursing homes). He sold his practice to Dr. Dave Keim in 2006 and I continue to work for him. Dr. Keim has the same passion for these people so we have a very large patient population that is special needs, geriatric and Medicaid. Seeing the needs of these special people was the driving force for getting my Limited Access Permit (LAP). I am grateful to the hygienists of MDHA, Sue Fisk and others, that fought to get laws passed allowing us to use the LAP. It took me several months to get through the process of applying for NPI number, getting the extra CEs and the other “hoops” you have to go through to get your LAP. There are some pamphlets that outline the process but it still takes a little time. The next step was figuring out how to get started at the nursing homes. That is my passion, the elderly and special needs patients at the nursing homes. We see many at our office but I knew there were many that were not being seen. So I wrote a letter of introduction with copies of license & malpractice insurance and started calling nursing homes in Kalispell and the closeby towns. It took a little perseverance but I was able to meet with nursing directors and social services people and finally got it started Jan. 2009. Parents’ Education Center at the Alternative High School and a nursing home. Some ideas that will help you! Put your self in the facilities shoes, what do they want and need and how can you fill their needs. Present information that support preventative care— research that shows connection between oral infection and diabetes, pneumonia. You don’t need all the equipment all at once. Many hygienist work in facilities with no suction or dental unit. Simply hand scale. Read the LAP law an make sure you cross your t’s and dot your i’s. Staff education should be included in your over all plan. LAP hygiene is very rewarding but takes a creative, flexible, driven, resourceful, caring, person to make it a reality. I have had my LAP for two years. I had previously practiced in Minnesota. Minnesota is a very progressive state, allowing Hygienists expanded functions and further education for Advanced Practitioner positions. So, I have always been eager to further my education and explore my field of dentistry. When I moved to MT and knew the LAP was an option, I was all over it. 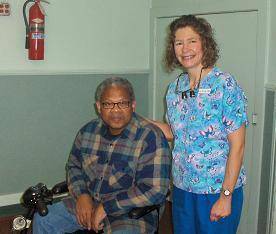 Since I have held my LAP, I have been working in a couple different nursing homes in Billings. 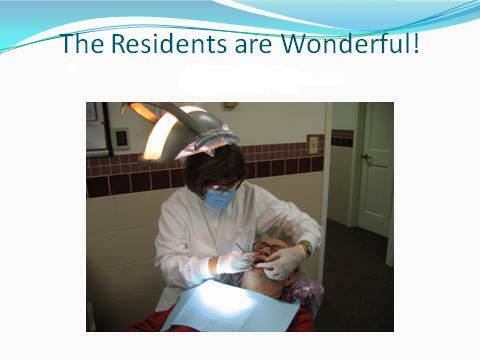 Currently, I am working with three other Hygienists on Fridays at St John’s Lutheran home. We use our portable equipment and usually see three residents. We always make sure to have two of us there at all times to help out where needed. I have really enjoyed my time working with the residents in both of the homes. The staff has been welcoming and helpful in aiding me to provide dental care to the people who would not otherwise be getting it. 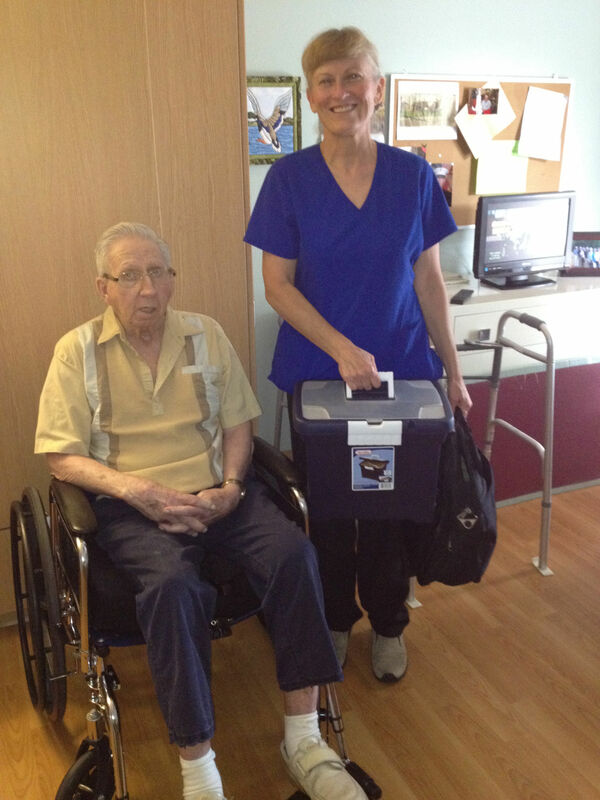 The residents are a joy to visit with and they are appreciative of what we are doing. I work full time, so it is great for me to be able to set my hours for the Fridays that I can be available at the nursing home. It’s been a rewarding experience. For the past 25 years I have worked consistently 4 days a week in a private practice in Missoula. I was looking for a new adventure and in June of 2013 I decided to get my LAP. Fortunately, when I shared my plan to work in nursing homes I had several people who believed in me and supported me financially. With these donations I purchased the portable dental equipment I needed. Once I had a light for my loupes, cordless polisher and dental instruments (donated by American Eagle Instruments) I called my first nursing home. The executive director said, “yes we want your services! When can you get over here?” When I arrived she said, “what can we do to help you get started?” I quickly found out that there was a community need that I was able to meet, and that is how my business, Dental Hygiene At Home began. I worked in private practice for Dr. Tom Lidahl for 31 years. He sold the practice in 2011 and one year later I was without a job. Obtaining my Limited Access Permit had always been on my radar, but I had not pursued it because I was as busy as I wanted to be with my job at Sheridan Dental Clinic in Plentywood. At the 2013 MDHA Annual Session, I began networking with other hygienists who were embarking on LAP career moves and I quickly realized that I wanted to do the same. In the spring of 2014, I attended the LAP workshop at Fairmont offered by MDHA. I was very inspired to roll up my sleeves and get going on this great opportunity to serve a population that seems to have so many limitations to hygiene services. One thing that really stood out in my mind, as I was driving the long road home to Plentywood, was when Heidi Halverson spoke to us about her experience of getting started with her own business in Missoula. She did not mince words, she admitted that it was hard because there were many steps to take in order to get the necessary paperwork in place, but the one thing she stressed was “every single one of you in this room can do this!”. Those words rang in my head over and over and I was determined to become an LAP hygienist. Within a few months, after obtaining the additional CE’s that I needed, I applied for my license and was beyond thrilled when an email came with my new license listing my LAP endorsement. What a thrill that was! I think bells and whistles were going off in my head, and I couldn’t stop smiling!